Dr. Erin Bowman joined our practice in August 2013. She prides herself on her bedside manner, often spending extra time with patients as well as consistently making herself available beyond office hours by providing patients with her cell phone number. She also routinely calls each patient the night before surgery to make sure all of their questions have been answered and concerns met. Her efforts, along with her inviting smile, help ensure patients feel at ease, despite their breast cancer diagnosis. A Philadelphia, Pennsylvania native, Dr. Bowman, who graduated from Spelman College with a Bachelor of Science in Biology, considers Atlanta to be her second home. Upon receiving her degree, she returned to Philadelphia to complete a Masters in Biological Science at MCP Hahnemann University before heading to Boston University School of Medicine, where she earned her Medical Degree. Dr. 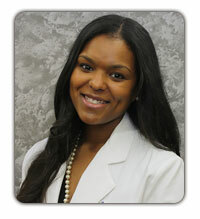 Bowman eventually found her way back to Atlanta for surgical training at Morehouse School of Medicine. Following her general surgery residency, Dr. Bowman completed a Breast Surgical Oncology Fellowship at Emory University School of Medicine. Dr. Bowman is board certified by the American Board of Surgery. She is a member of the American Society of Breast Surgeons and Society of Surgical Oncologists. In her free time, Dr. Bowman enjoys spending time with her husband, who is an anesthesiologist, and their children. She also enjoys cooking, traveling and exercising.